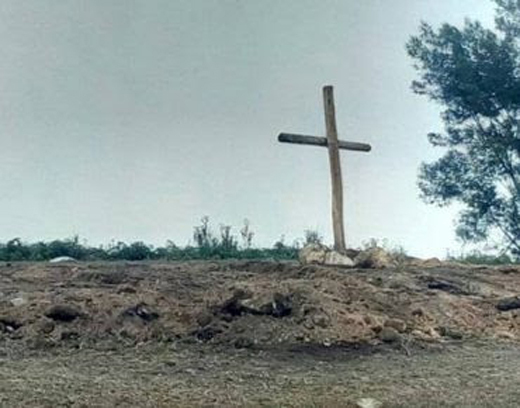 Kerala, April 24, 2017 : Christian groups in the southern Indian state of Kerala are protesting to the authorities on removal of a cross atop a hill as the local communist-led government reclaims land from encroachments. 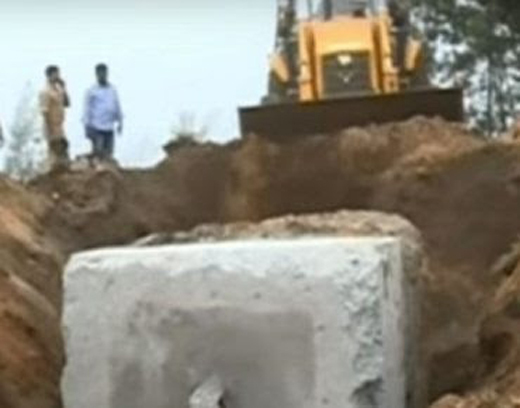 A team of officials employed jackhammers and bulldozers April 20 to remove the concrete base of the 8-meter iron cross that a neo-Christian group "Spirit of Jesus" erected in the Pappathshola hills area — illegally, according to officials. The group runs a prayer and retreat center in the tea-garden tourist area of Idukki district. No official from the group was available for comments at the time of writing. "The demolition of the cross has pained the entire Christian community," said a statement from Varghese Vallikkat, deputy secretary general of the Kerala Catholic Bishops’ Council, a joint body of Catholic bishops. The government launched the eviction after investigations proved there had been extensive land grabbing in the area. Local language media has been reporting how politicians and the rich colluded to grab public land and build resorts and private houses in the fast-developing tourist area. The area is part of Idukki Diocese, whose officials have already conveyed their protests to the state chief minister, according to Father Jose Karivelickal, the diocesan spokesperson. "Christians hold the cross with lot of reverence. The officials should have shown respect to their feelings when they pulled down a powerful symbol worshipped by Christians all over the world," Father Karivelickal said. The priest said authorities had not discussed their decision to demolish the cross with church officials. "This is wrong. The government should have dealt with the issue more carefully," he said. ocal Christians said followers of the Spirit of Jesus group and other locals thronged the area when revenue officials arrived to demolish the cross. At the risk of being arrested, they tried to prevent the removal. Some tried to block the government team by leaving their vehicles on the road. However, the administration used excavators to clear the road blocks and police removed the protesters. Kerala state Chief Minister Pinarayi Vijayan, while addressing a public meeting following the event, said the authorities should have been more careful. However, he criticized media reports that said the cross removal was an attempt to portray the communist leaders of the state government as being against the cross. Christians, who constitute nearly 18 percent of the state’s 32 million population, have long feared that the communist distrust of religion would pose a threat to their faith. However, the communists have never tried to impose their ideology on Christians ever since they came to power in the state for the first time in 1957. Munnar, April 24, 2017: An evangelist has been booked in connection with the erection of a 30-feet tall metal cross, allegedly in government land here which was later removed by revenue officials. A case has been registered against Tom Scaria, an evangelist of the ‘Spirit Of Jesus’, under section 447 (criminal trespass) of the IPC and under provisions of Land Conservancy Act at the Shantapara Police Station here, police said Friday. The FIR was registered on the basis of a complaint filed by the Additional Tahsildar of Udambanchola. The cross, set up under the garb of ‘spiritual tourism’ atop a hilly area, was brought down with the help of earth movers. Kummanam wondered why Vijayan is now taking a soft stand over removal of the cross as he had earlier denounced a Sunni sect’s move to build a mosque.